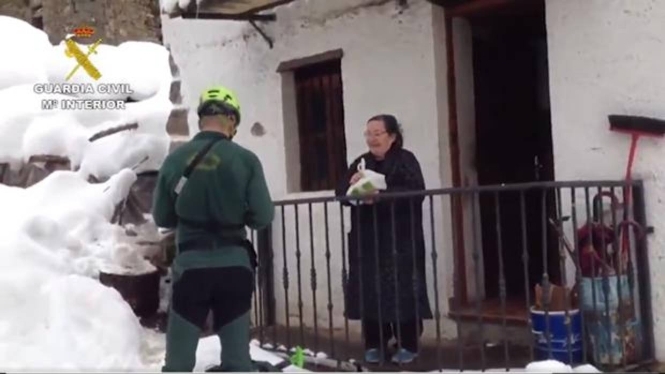 TWO Guardia Civil officers have been hailed after they skied for four hours to deliver medicine to an elderly woman trapped by snow in northern Spain. The men were forced to abandon their car as they tried to reach the tiny mountain hamlet of Viboli in the Ponga Natural Park, Asturias. “We stopped at the chemist then left our car first thing in the morning because at that time the temperature is so cold that there are less avalanches,” Pablo Villabrille and Alberto Alonso told Spanish media. When they reached the village hours later, Balbina Tomas and her son were waiting for them with hot coffee. “The truth is that actions like this are incredible,” she said. The heroic deed comes after much of Spain was ravaged by freezing weather, leaving many smaller villagers cut off.